Beans, beans good for the heart. The more you eat the more ….. you will love how healthy and versatile they are. I have always loved eating beans from when I was a child to adulthood. Unfortunately, when I was growing up the beans I ate were made the true southern way and were not quite as healthy. Delicious? Yes, but made with fat back, ham hocks or both the beans of yesteryear put more weight on me rather than help take weight off. As I got older, I decided to look for new ways to make delicious beans that would be beneficial to my health and would be a great side dish for dinner with my family and friends. During my search I found out that beans have a high nutritional value. Black beans and white beans are packed with fiber, protein and antioxidants which help to make you feel full and energetic at the same time. Plus, beans are easy on your budget. Since I am constantly searching for a new twist to old dishes, my black and white bean salad came together on a lazy summer day when I wanted to make something easy and light for dinner. Fresh veggies and herbs are plentiful during the summer especially if you have your own garden. 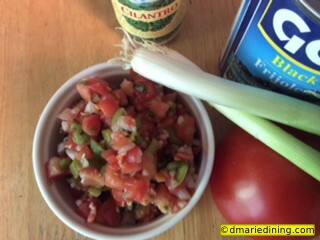 If you are adventurous, you can make your own fresh salsa like I do by using the tomatoes, onions and herbs from your garden. If not, you can always find wonderful fresh salsas at your local grocer. 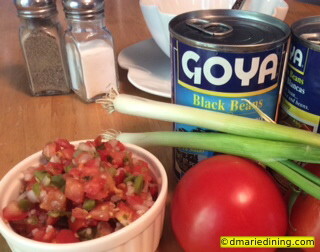 Whether you make your own salsa or buy it from the grocer just make sure the veggies are fresh and the beans are rinsed. Not too long ago I put my bean salad to the test by having my son make it for a project in his health class. Each student had to make something healthy and bring it in for the class to taste. T’s original idea was to make guacamole from scratch accompanied with light corn chips. Well, that idea went out the window when he forgot to make the guacamole the night before it was due. Of course it was Mom to the rescue and I told him he could make my bean salad which would only take a few minutes. Needless to say, the salad was a hit, he got an A on the project and his teacher even asked for the recipe. 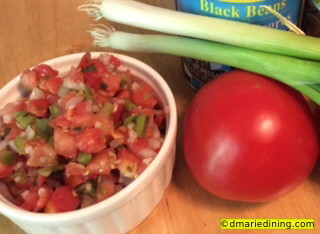 Now, if my teenage son can make a quick black and white bean salad I know you can too. The secrets of any good recipe are the quality of the ingredients as well as the time and patience used to prepare it. 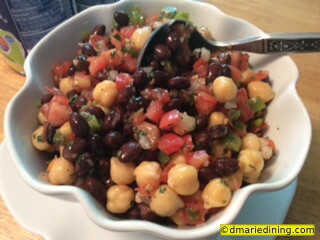 One of the best ingredients in my black and white bean salad is Gazebo Room Greek Salad Dressing and Marinade. This is a fantastic salad dressing and I use it a lot to add great flavor to various salads. 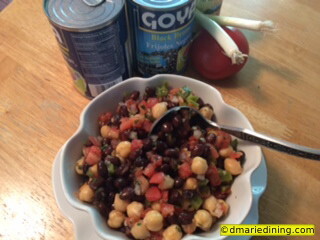 Whatever Greek dressing you decide to use I am sure the bean salad will taste delicious. Add the beans, fresh salsa, parsley, onion, cilantro, dill, lemon juice and seasonings to a large bowl. Pour the dressing over the bean mixture and stir gently until thoroughly blended. Chill for 1 hour. Serve chilled or at room temperature. My name is Newell Rinehart, and I’m the Website Designer/Social Media and Marketing Coordinator for Gazebo Room Salad Dressings. I wanted to contact you to let you know how much we loved your blog post about our products, and to ask if it would be alright if we add a link to our website to direct some of our website visitors and social media followers to your blog to check it out. If you are interested, we would also love to connect with you on Facebook, Twitter, Instagram and Pinterest (we hold contests to give away a year’s supply of Gazebo Room twice a year!). If you’re interested in this opportunity, please email me at nrinehart@gazeboroom.com. Gazebo Room Social Media and Marketing Coordinator.